christmas crafts – ActiveDark.com – Glowing Ideas! How to Make a Light Up Gift Bow! A very easy and simple way to create your own dazzling light up glowing gift bows! 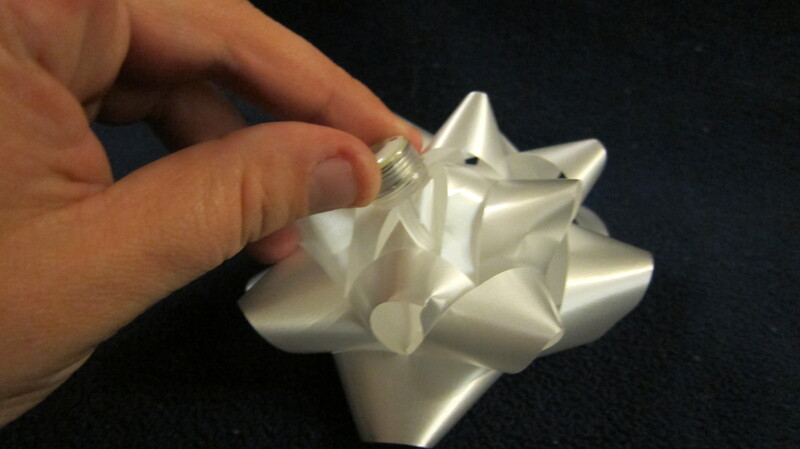 All you need for this simple homemade craft is a standard gift bow and a Color Changing LED Mood Ring. Simply place the LED Finger Ring into the gift bow and viola, you have a wonderful lighted gift bow! Use a piece of scotch tape to secure the ring to the inside of the bow for added stability. You can also try using different colored gift bows as the lighted effect will reflect differently on each color. LED rings attach very easily and can also be added to ribbons and other gift decorations for a cool, attention grabbing glowing effect! Use scotch tape if you need additional stability. Add a simple LED Finger Ring to any Gift Bow!